Sleepwish throwsare made from microfiber plush material, so much softer than fleece to provideyou with the most luxurious comfort. Outstandingsoftness, super soft micro mink fleece on one side, plush super soft sherpa fleece on theother. The fleece and sherpa backingwill add an extra dimension of comfort and warmth. Only one side printed. Pull it on, snuggleup, kick back and enjoy the amazing comfort of this blanket after a long day ofwork. These throw blanketsare perfect gifts for all generations and suitable for all seasons. 50x60 inches -Suitable for the couch, daybeds, nursery, camping or porch sitting. 60x80 inches -Suitable for the couch, daybeds, camping, toddler beds or asa nursery blanket. Machine washable incold, dries quickly on tumble dry low temperature. Note: These throw maylose its softness and texture if washed with hot water and dried at hightemperature. Sleepwish throw designs will never go out of style while keepingyou and your loved ones warm. ✔BLANKET SIZE: 50"x60" inches, perfect to use when cold nights watching TV, reading a book on a coach, watching a movie or fireside chats. ✔SOFT & WARM: Reversible super soft crystal velvet on one side, plush super warm lambswool sherpa fleece on the inside. ✔FABRIC CONTENT: 100% polyester, fine for people with sensitive skin or allergies, also completely resistant to shrinking and wrinkling. ✔EASY CARE: Machine wash cold, tumble dry on low heat. Avoid direct heat. Do not use bleach. Made with shrink-resistant fabric. 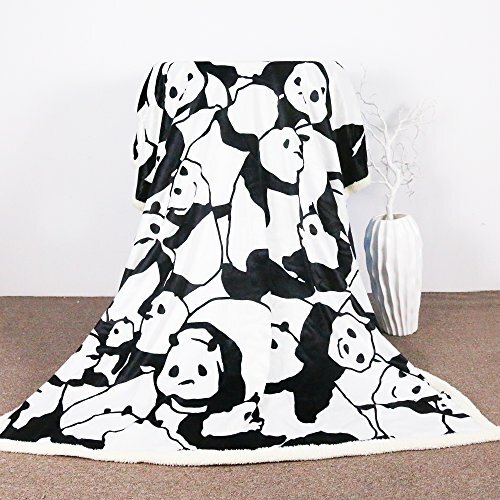 ✔ATTRACTIVE DESIGN: Panda Bear adorn the velvety side of this sherpa blanket - Cute little black and white panda playing together. He eats bamboo, he comes from China, but he lives in a zoo.